Trump’s build-a-wall plan, shockingly, to be funded by U.S. taxpayers, not Mexico. 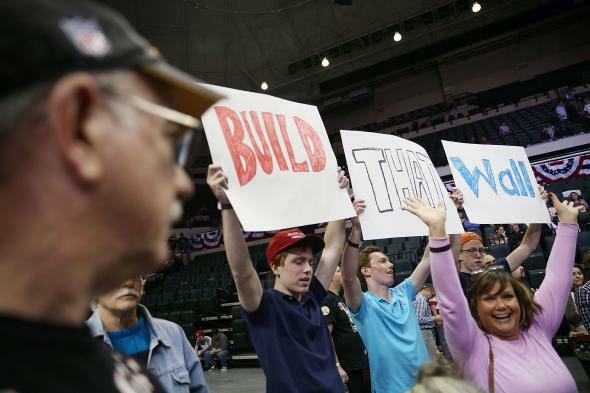 People hold “Build that Wall” signs at a campaign rally for Donald Trump on Feb. 12, 2016, in Tampa, Florida. The 2016 campaign wrapped up two unthinkably long months ago. But a lot can happen to a winning candidate’s campaign trail promises in that amount of time. So, it’s time for a quick pop quiz to test your 2016 campaign fact retention. Question #1: What kind of structure did Republican candidate Donald Trump promise snarling crowds he would build between the U.S. and Mexico? Post-Election Reality Side Note: The wall may actually be more of a fence. But a totally beautiful one, surely. Question #2: Which country is going to be paying for the (fencelike) wall? Answer: Mexi … not so fast, really mad rural white swing state voter.